Pet Disasters by Claudia Mills. A Mason Dixon Story. Review: Would you like to have a pet? A fish? A cat? A hamster? A dog? These are the pets that Mason has in the newest Mason Dixon novel, Pet Disasters by Claudia Mills. His parents feel that since he is an only child he needs the comfort of an animal. Unfortunately, Mason thinks otherwise. His fish is overfed, his best friend is highly allergic to his cat, and his hamster escapes through an open door. Mason is an ordinary, calm child. He prefers the simply ways of life. He likes brown socks and brown socks only. He is even simplistic in the naming of his pets. He names all of his animals after the type of pet they are. He does not like to call attention to himself. His parents' next animal for him is a dog, which he names "Dog". He is supposed to share the dog with his friend Brody. Dog is a 3 legged rescue dog. At first Mason is reluctant to get involved with Dog, but after life altering experiences, he changes. Instead of Mason being ordinary and predictable, he confronts a bully and deals with almost losing his best friend and Dog too. Mason finally realizes that this 3 legged dog can fill holes in his life and heart. 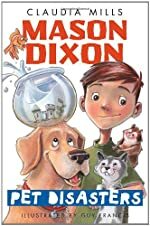 While reading Mason Dixon Pet Disasters by Claudia Mills people start to wonder why Mason's parents insist on getting him more and more pets. After Dog comes into his life he turns into someone else. This book teaches that life can change all the time and that is okay to act and feel different. It is a great story about friends, bullies and animals and how they can all help one another. I would highly recommend this book to third to fifth graders. I give this book a 4 out of 5 because in the beginning of the book it was confusing why parents would keep on giving him a pet after a pet. Review written by Cesco (6th grade student). We would like to thank Random House for providing a copy of Pet Disasters for this review. Have you read Pet Disasters? How would you rate it?